Last spring, Other World Computing launched what it claimed to be the first Build To Order (BTO) store for legacy Mac systems on the Internet. The legacy BTO systems offered are covered by a 45-day warranty on the computer itself (base Mac or Mac clone system). Standard warranties apply to any extras that you add to the system. All memory has a lifetime warranty. All systems shipped for delivery within the United States qualify for $5 FedEx. Orders of $250 or more may be shipped UPS Ground for free if delivery is within the 48 continental United States. The base systems are usually sold with just a case, motherboard, floppy drive, and whatever memory or video was built into the motherboard. All other components are selected from a list of BTO options for each computer. You can thus mix and match to your heart's content, putting together a system that best suits your needs and budget. As regular Miscellaneous Ramblings readers know, I bought a brand new leftover Umax S900 six-slot minitower for $300 back in May from OWC's BTO store, and I've been happy with my purchase, but I should note that I already had a 200 MHz 604e processor card, video card, RAM, a keyboard, and a mouse from a derelict Power Mac 9500 that used the same motherboard design as the Umax does. In theory, I am enthusiastic about this concept. Anything that can extend the useful life of perfectly good computers has my support. The disposal of obsolete computers is becoming a major environmental problem. To cite just one example, computers expected to be discarded in the U.S. between now and 2004 contain 600,000 tons of lead. Obviously, since I "voted with my feet" on this matter by buying the S 900, I think it has merit, but the problem I perceive is with value. $42.50 sounds pretty cheap to get you in the door, but the problem is that even if you got the basic computer case and motherboard for free, the other stuff that you need to turn the carcass into a usable and contemporarily fast computer is going to run you as much or probably more than the purchase price of a new basic iMac 350 MHz, or even the 400 MHz iMac DV, both with a 100 MHz system bus, a big hard drive, much better video support, lots of bundled software, and a full new computer warranty. On the other hand, if you need PCI slots, more than one RAM expansion slot, or extra drive bays, the iMac is not a viable choice. These modular BT0 machines also give you a lot more flexibility in terms of what sort and size of monitor you can use with it, and if you already have on hand, or can scrounge cheaply or for free some of the components that you need rather than buying new stuff, BT0 machine can begin to make financial sense. The ones that I currently find most interesting are the first one and the last two on the list - the PowerMac 7200/75, and the Motorola StarMax 3000/180 and 4000/200 towers. 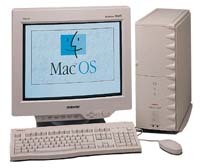 The 7200 is widely regarded as one of the least desirable Macintosh models - a "Road Apple" - not because it has any serious functional defects or is unreliable, but because its processor, until recently, was not upgradable. Actually, the 7200 is quite a nice package. It has four RAM slots; 3 PCI expansion slots, which make upgrades to USB and FireWire support possible, for example; on board video support; and a full set of legacy Mac ports. It is quite easy and convenient to open up and work on. It is also a pretty tough old bird. The one that my son had took a lot of abuse, and is still going strong as my brother-in-law's main machine. On the downside is the processor upgrade issue, and the 7200's poky 37.5 MHz system bus, both of which have been addressed by Sonnet Technologies, who have developed an innovative processor upgrade card for the 7200, introduced in a G3 400 MHz/1M version last month, that fits in one of the PCI slots. With the processor upgrade working on the PCI bus, Sonnet was obliged to provide 3 DIMM sockets on the upgrade card that match those on the 7200 motherboard. One small DIMM must remain in place on the motherboard to handle initial booting, but the remaining memory can be moved to the upgrade card. Because the 7200's motherboard runs at bus speeds ranging from 37.5 to 45 MHz, Sonnet incorporated design elements from their recently announced Fortissimo technology, creating an independent bus to run on the new processor card. This bus runs at a speed of 66 MHz (the same as the iBook and Lombard PowerBooks), which allows the Crescendo 7200 to take full advantage of a 400 MHz G3 processor and beyond. Sonnet's Crescendo G3/7200 400/1M sells for a hefty $499.95, but considering the speed and the engineering that went into it, it would be hard to anticipate less at the product launch. That gives us a grand total of $1048.95 - in the neighborhood of the 400 MHz iMac DV, but with more RAM and a smaller hard drive. Which is the better value? That depends upon your needs and tastes. The other selection from OWC's current BTO crop that I find interesting is the Motorola StarMax 3000/180 at $90.00 (or a 4000/200 at 110.00, which comes with the same 604e/200 processor that I have in my S900), which supports G3 upgrades up to 300 MHz, has a 40 MHz system bus, three 168 pin DIMM RAM slots supporting up to 160 Mb of RAM, a full set of legacy Mac ports, a floppy drive, two 5.25" drive bays, two 3.5" drive bays, and 5 PCI slots. Unlike the PowerMac 7200, the StarMax has a factory IDE internal bus that allows you to choose from a cheaper and wider selection of internal IDE drives. The StarMaxes are solidly built machines that originally sold with a five-year warranty. That gives us a grand total of $805 - or just $6.00 more than the basic 350 MHz iMac, with a slightly slower processor, much slower system bus, but a larger hard drive and much greater expandability. Given this choice, I think I would lean toward the StarMax, but that might not be the best choice for you. For more information on OWC's BTO offerings, visit their site.